An easy dinner idea for two, or side for the whole family! Packed full of veggies like kale, peas and carrots and delicious chicken sausage! Today's going to be a pretty lazy day around our house which is much needed! We will be venturing out later to hang out at my sister's house and enjoy the Superbowl festivities but other than that, home it is! It's been a pretty low key week over all, for once! We enjoyed a play at our local theater on Friday evening and spent all day yesterday at home. I've tested quite a few new recipes the last few days so I can keep new ones coming to you every week! The play we saw Friday was Anne of Green Gables and it was so good! 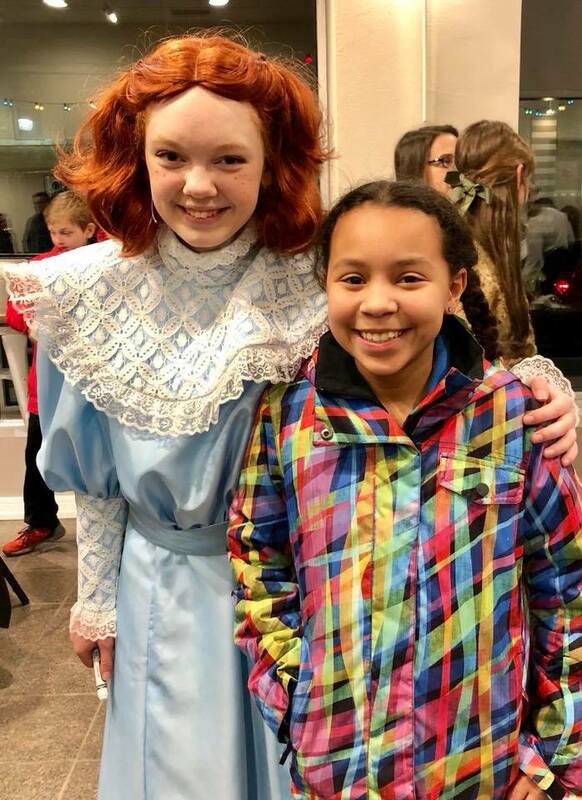 Here is a picture of my daughter and Anne! The cast was hilarious and our local theater company, Great Theatre really does a fantastic job with their performances and cast! Plus our theatre, The Paramount is old and gorgeous and it's always a treat to go there and see a show! Once again, I'm joining my blogging buddies over at Sunday Supper for today's recipe! The theme is "Simple Dinner for Two Ideas." 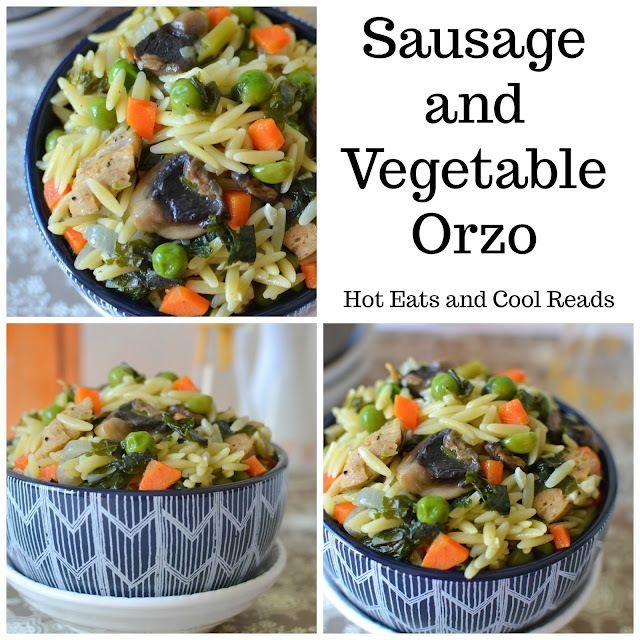 I'm sharing my tasty and easy Sausage and Vegetable Orzo! 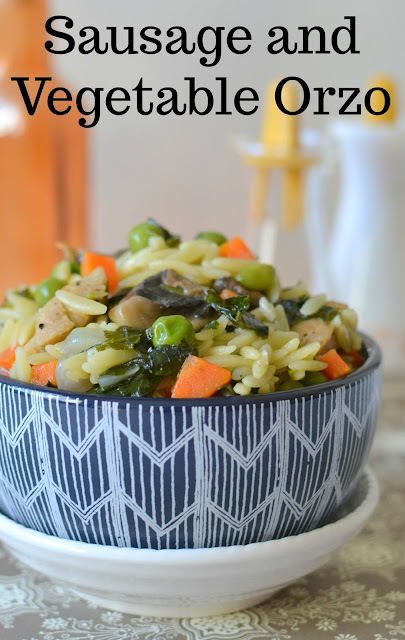 Our family loves making these orzo dishes for dinner. Not only is it fast, but it's a great way to use any meat and veggies that we have in the fridge or freezer. 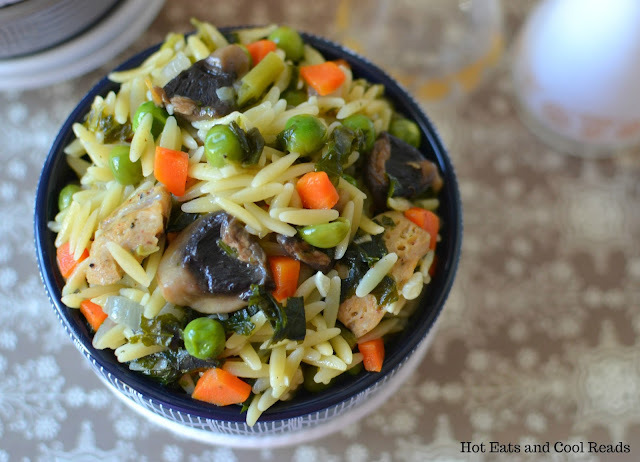 We always have some flavored turkey or chicken sausages in the fridge, combine that with the veggies and any flavor broth, and in less than 20 minutes dinner is on the table. This meal is great as is for two people, but you can add some salad and bread and make it enough for a family of four! It's also great leftover for lunch the next day! Check out the lovely "Simple Dinner Ideas for Two" from my talented blogging buddies! 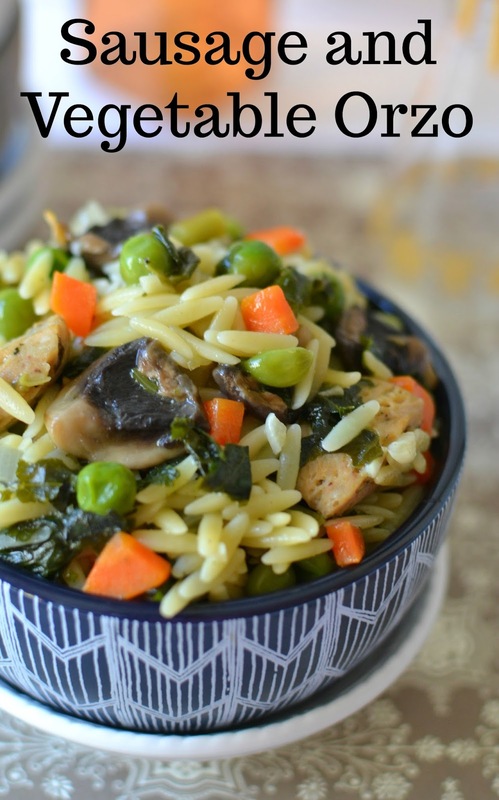 If you liked this recipe, give these orzo recipes a try: Lemon and Asparagus Orzo, Tomato and Cucumber Orzo Salad, Kalamata and Bell Pepper Orzo Salad, Baked Chicken Tenderloins with Orzo and Peas, Parmesan Basil Orzo, Cheesy Spinach and Rice Orzo or Beefy Mushroom Onion and Orzo Soup! Add the onion, garlic, carrot and sausage. Saute for 4-5 minutes, stirring often. Add the mushrooms, and saute for another 2-3 minutes then add the peas and kale and saute for 2-3 minutes. Turn heat to medium high, then add the chicken broth. Bring to a boil, then add the orzo and reduce the heat to medium and cover. Simmer for 9-11 minutes until liquid is absorbed and orzo is cooked through. Season with salt and pepper, if needed. Nothing better than cooking up a quick meal with what you have on hand. Sausage is often my go for a quick meal. A simple sauce with veggies works great! I love quick meals like this! Such a hearty and colorful risotto!